31 Aug 2018 Srujanavani Skill Development Centre, Veeravilli Agaraharam. Language has always been an intricate part of the Indian culture. Language symbolizes the values enshrined by the society. In fact, the rich culture and heritage of a nation is reflected in the importance endowed to safeguard its languages. However, with the onset of globalization, onslaught of English on the regional languages has been immense. Nations are thereby caught in a flux to decide between the growing global economic demands versus the efforts to safeguard their regional language and culture. If the scenario continues, linguists fear the death of local language as an imminent threat. Besides, language plays an important in developing expression skills. Inability of an individual to express in their local language is evident in their lack of comprehension skills. Therefore, it is time that everyone should reflect on working towards safeguarding one's own language. While it is important to learn the global language English, it is in fact more important to safeguard one's language and thereby our existence. In this context, Srujanavani makes a step in this direction. Every year on the birthday of Shri Gidugu Ram Murhty pantulu garu, who has contributed immensely to bring Telugu language to the reach of masses is being celebrated as Telugu Bhasha Dinotsavam. We at Srujanavni celebrate this unique celebration at our Srujanavani Skill Development Centre, Veravalli Agraharam. On this day students from various schools are invited to participate in various competitions and prizes are distributed to the teams based on their performance in various categories. Besides, Telugu teachers of the schools who outperformed the others are also felicitated on this occasion for inspiring the students and nurturing them in Telugu language. As is the case every year, Srujanavani geared itself and made the necessary preparations for the occasion. Categories like stage performance, Telugu language based quiz, etc. were conducted to 6th, 7th, and 8th standard students. Chief Guest, Shri. Yohan Babu, Professor – Andhra University, who gave an eloquent speech on the importance of language in our daily life. Similar our Guest of Honor, Shri. 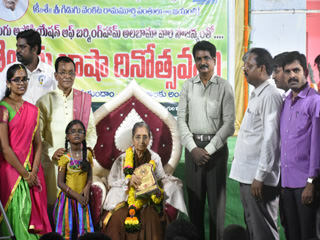 Bulusu Venkateswarlu garu and Smt. K. Annapurnamma garu along with Srujanavani founder Shri. 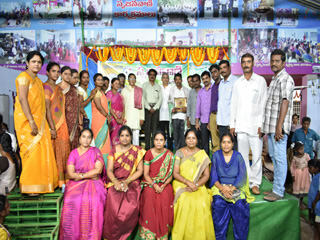 R. Ravi Kumar garu graced the occasion. As a token of gratitude to the yeomen service being done to promote Telugu language, we had the honour of felicitating Smt. Annapurnamma garu. On the day of celebration, nearly 250 students representing 25 schools from Butchayyapeta, Cheedikada, Chodavarm, and Madugula Mandals were present. 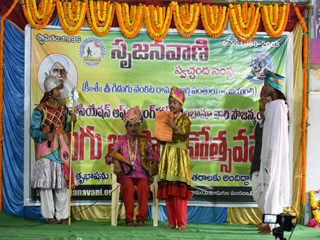 Skits like Bhuvanavijayam, Poornamma katha, ‘Srinadhudu chaatuvulu’, Jangayaa sastry vimarasana’ etc. were performed on this occasion. Children actively participated in the Telugu quiz. With the students around the campus, the Centre breathed renewed life of hope and energy.